Generations Apps are used by homecare agencies to help facilitate communication across the entire care team to drive higher quality of care for the elderly and convalescing. Homecare agencies provide services to elderly and convalescing clients most often in the care recipient's home. These services, ranging from companionship to skilled nursing, are paid either directly by the client or by a 3rd party payor, typically Medicaid or an insurance company. "IDS is committed to utilizing the most technically sound standards at all levels of our service," says Lisa Ferden, Vice President of Integrated Database Systems. "With the release of Generations Mobile, we've watched our user base readily adopt this technology. For some time now, Generations has offered a mobile version of their SaaS as an app for Android and iPhone users. This week, the company announced the Generations App is now available for Kindle tablets including the Kindle Fire phone. 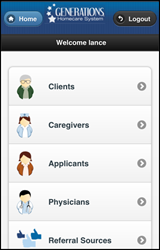 Generations Apps are available for administrative staff, caregivers, clients, and their families to keep the entire care team in communication. Depending on the job function, a different version of the app is presented to the user with their specific features. By using the Generations App, a homecare agency has the ability to do assessments while at the client’s location, record and track marketing activities for referral sources, find a caregiver to fill a shift, verify caregiver visits, and more. Caregivers use the app to check schedules, view the care plan, complete assigned tasks, enter visit notes, and verify visits using GPS technology. Clients and their family members are able to use the app to view assignments, care plan, visit notes, and can opt in to receive alerts when the caregiver arrives and departs. "With the release of the Fire phone, we anticipate the demand for apps on the Amazon platform will continue to grow," indicates Lance Ferden, President of IDS. "We are ready to meet the demand for a truly mobile homecare workforce."